This is my first full year of joining in with the Siblings Project as Athena was born in May last year and I am so excited to see how the girls relationship develops as Athena gets older. 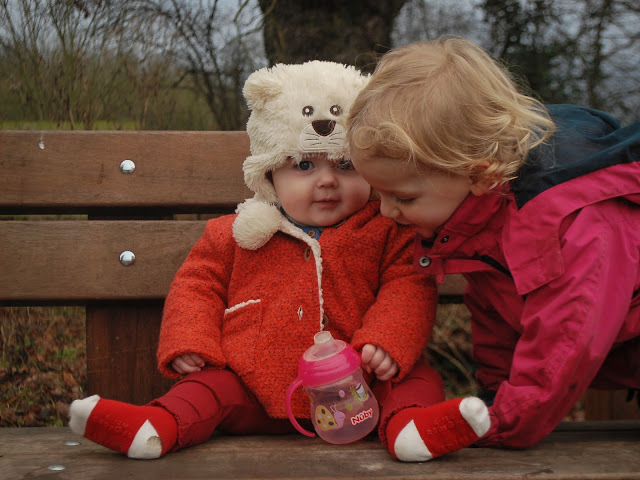 This will be the year that she goes from baby to toddler and I cannot wait to see how much mischief the two of them will get into together. Because I am in no doubt that mischief is what they will be up to. They’re already thick as thieves and Athena just idolises her big sister which I think you can really see in this month’s photos. The best thing about this month in Lyra’s eyes is probably that Athena is now eating food. This means that they get to sit up at the table together and eat dinner each evening which is becoming a very lovely, if very messy, part of our day. We’re also trying to get Athena into more of a bedtime routine in the desperate hope that she will sleep more so the girls are sharing a bath every night too. 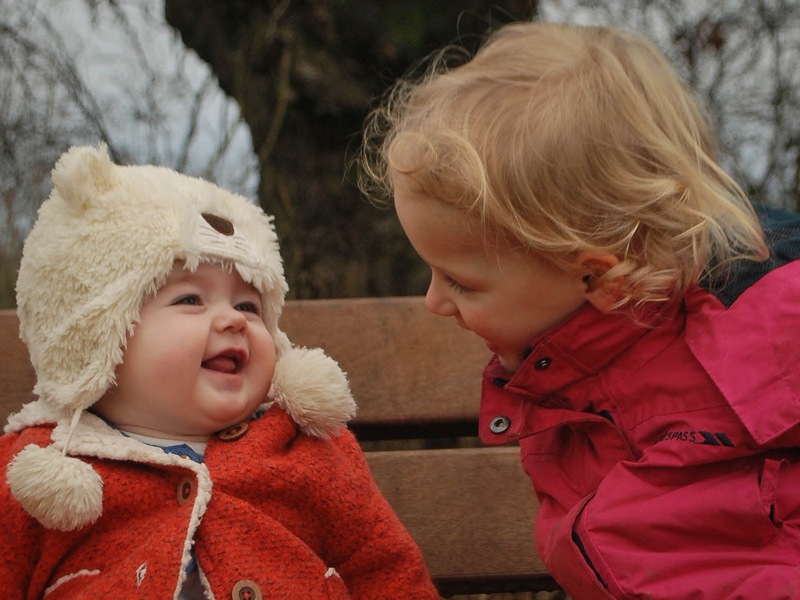 Lyra is so happy that Athena is joining in with more of her day to day activities. She’s still a little rough but she really does have the best intentions. For example Athena has mastered the backwards crawl this month so we’re finding her backed up under the sofa quite regularly. Lyra desperately wants to hep her so tries to drag her out which obviously does not end well! They both seem to still love holding hands with one another and I hope that that habit is here to stay because it is so cute. Speaking of heart melting moments, I sing Athena the same lullaby that I sang Lyra to calm her and now Lyra tries to join in to cheer her little sister up. Adorable! 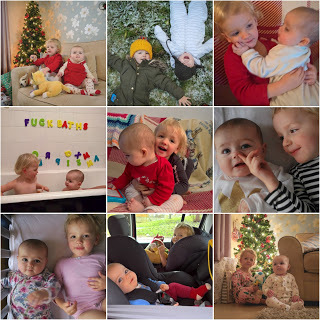 This month’s photos were taken one weekend whilst out and about, Athena is usually in the Ergo the whole way round but we took a little break and got her out for a while. 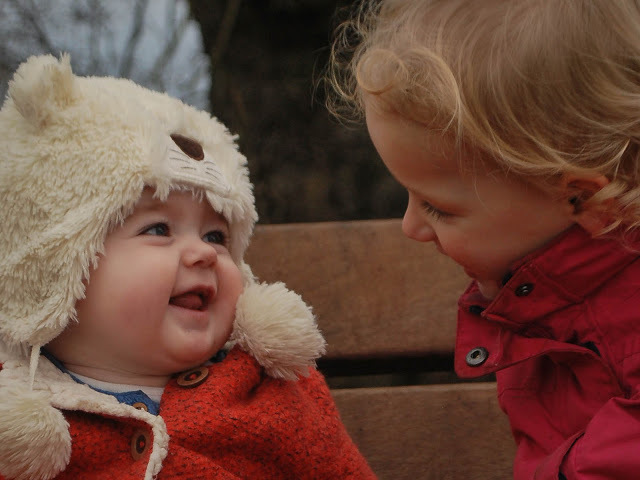 Lyra was so excited to see her sister ‘free’ and was eager to show her everything around her. Since we were mostly surrounded by mud we had to keep a close eye on the two of them. I get the feeling I’ll have to keep a close eye on them all the time now. But at least life will never be boring! 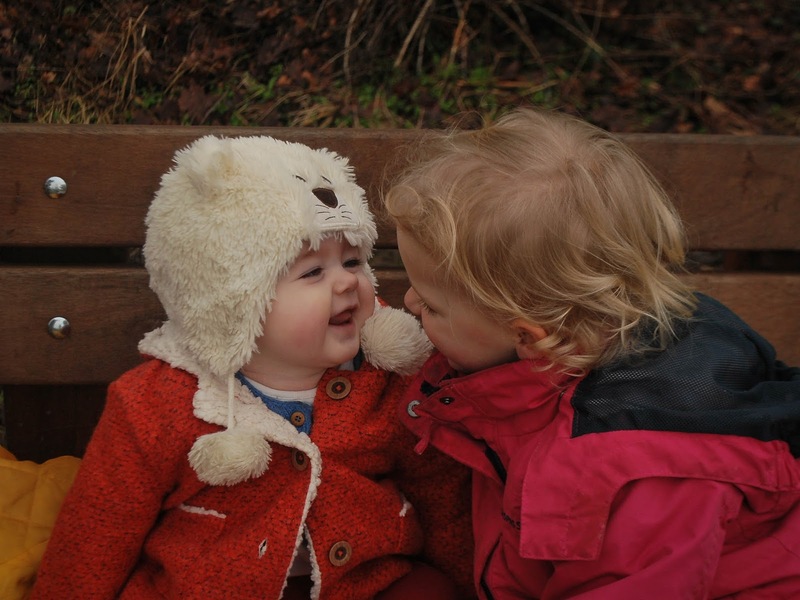 Ahhh.. My eldest two are girls, eighteen months apart and they are the best of friends… Looking at your photos reminded me very much of the dynamic between my two in the early days! So sweet! 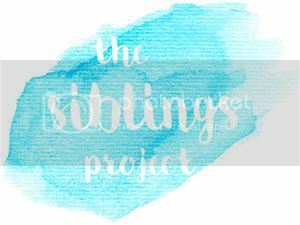 Welcome to #siblings! It's such a lovely project, and so wonderful to have an incentive to keep those documented days stored up!